Assuming we’ve already read and internalized these nuggets, I’ll just skip ahead to showtime. Hint: I like to write my own set-lists and tape them where I can see them. It’s a habit that makes me comfortable. On these set-lists, I will often scribble a note for each song such as “count off the guitarist for this one,” or “switch to mallets,” or “don’t forget those crazy hits at the end.” These are just reminders to glance at from time to time. Beyond learning the songs, I also take the time to walk through the moments that occur between the songs. For instance, does the singer tell a story or joke between songs #2 and #3? Or, is there a non-stop segue between songs 7-8-9? I like to be in charge of time between the songs so as to keep a good flow. It’s almost a choreography that I develop (tighten the loose snare drum lugs here, drink a sip of water, fix the hi hat clutch, switch to brushes, add a sizzle chain to the ride cymbal, switch the patches on my sampler, crack an inside joke at the bass player). This all happens seamlessly during the few seconds between songs. Beyond that I would say, (1) shake hands with all the band and crew members before you go on. So many people are in their own worlds before a show. Smart phones, ugh! This is a team effort. (2) Expect that things will go wrong on stage, and embrace those moments. They can be a whole lot of fun! And, (3) hug and celebrate with your gang of musicians once the show is completed. It’s not just a collection of songs. It’s an event! At some point, the topic of “Look” will probably come up. A person called a “Stylist” will probably tell you to “wear all black” and “just look cool”. Rock & roll. OK. So we’ve confirmed the dates for this upcoming performance. We’ve learned all the music. Now we have to organize the logistics of the equipment. You’ll probably have to find out, “Does the venue/studio have its own backline? Or shall we rent a drum kit? Or do I need to bring my own gear to the gig”? Then, according to the music, I will decide on drum sound options. The kick drum size, and its tuning. The amount of toms, and their sizes. Coated Ambassadors vs. Clear Pinstripes? A metal or wood snare drum? How about a side snare drum turned off and cranked like a timbale, or deep and chunky? Which cymbals would work well, and how many? Maybe an extra mounted hi hat would be cool. Double-pedal? Are there mounted percussion elements that would add to the music, such as tambourines, cowbells, roto-toms, more cowbells? Of course, we’ll need a gong bass drum. 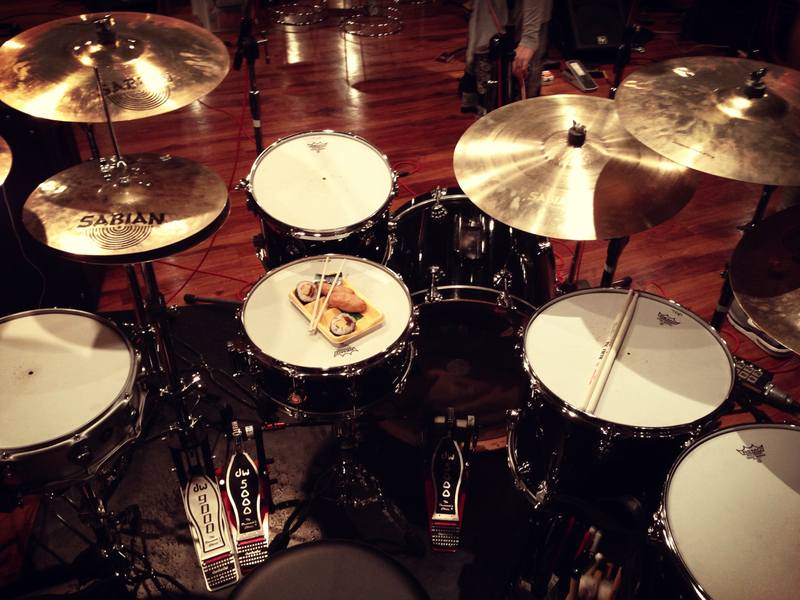 Trashy cymbal effects and cymbal stacks are en vogue. And so are treated drumheads with elements like car keys, jingles, splash cymbals, drum wallets, BigFatSnares, and Keplinger metal creations. Should I add a few electronic trigger pads and trigger pedals? Maybe I could use some alternate stick choices like brushes, rods, maracas, or jingle sticks. Maybe a song would sound better if I left the drumset altogether, and only played cajón, or marching snare, or pandeiro. Will we be on in-ear monitors? Will there be computer tracks? Will I be asked to run them? Now comes the real “homework” of the job. I set aside a period of time to chart out all of the songs. First, I start with a stack of plain white printer paper (although sometimes I will use whatever is available, a napkin, a torn sheet from a journal, or the backside of junk mail), a black pen, good headphones that allow me to distinguish kick drum patterns and bass lines, and any tap-tempo metronome. Then I go down the list of songs, writing out charts using my own version of notation and hieroglyphics. My charts are usually as detailed as they need to be, but not unnecessarily detailed. I still follow a system similar to the one that I learned for reading high school big band jazz charts. Left to right, top to bottom, with sections like: Introduction, Verse, Pre-Chorus, Chorus, Bridge, Solo, Outro, etc. How many bars are in each section? Include rests, accents, unison figures. Jot down dynamics (ppp vs fff). I notate specific beats, and signature drum fills. What would my hands be doing at any given time? RH on closed hi hat and LH on cross stick. Or RH on ride cymbal and LH on snare drum. Or RH on floor tom and LH on tambourine. I notate the tempo-markings. And if time allows, I will even check out alternate versions of the songs on Spotify or YouTube (remixes, live versions, cover versions). Step 2 of this learning process takes place on the actual drumset. I take my folder of charts, throw on the headphones, and play along with the iPod, seeing how the songs feel on the instrument. At first, I approach the songs exactly like the album versions (as note-for-note as possible). Then, I gradually adjust them in ways that I believe would make them even more musical. That might mean changing the subdivision of the hi hat from 16ths to 8ths, or adding ghost notes to the snare part, or simplifying the kick drum pattern, or coming up with an alternate drum fill that does not clash with the acoustic guitar part or the vocal melody. In general, I prefer to have all of the songs learned well enough to the point where I can do them exactly like the record, or differently from the recorded versions in case the artist, producer, or musical director requests a fresh approach. Brainstorm for multiple options. The artist could either be completely sold on their album version, or they could be utterly bored with it. You can’t be sure, so it’s a good idea to have choices. Step 3 is the memorization. Even though I’ve been working on my reading since I was in middle school, I prefer to not read any charts on stage or during recording sessions. Staring at a page makes me feel as though I have not internalized the music. Therefore, I go through a process of memorization. It’s a good brain exercise (like Sudoku)! First, I spend a good deal of time running through the music in headphones while staring at my charts. Then, I close the folder and spend time playing the music, still with headphones, but without the charts. This could be a bit bumpy at first, but it helps highlight the trickiest parts of the songs. Finally, I will switch from the iPod to a metronome, and just play through all of the songs with only a click track while singing the melody and arrangements in my head. This can be the toughest part, but only when I do this do I feel as though I actually “know” the songs. It’s as though I am inside all of the phrasing. And practically speaking, if things go wrong on stage (bad monitor mix, guitarist breaks a string, singer gets lost), I’ll know exactly where we are, and I‘ll be able to hold everyone together. As a drummer, you are often steering the ship! Now that you’ve accepted the gig, the next step of the process would be to get ahold of the music. Normally, a batch of mp3’s is sent to me by email (however, for recording sessions, I might receive entire Pro Tools files via a service such as WeTransfer). I like to put all the music in a playlist form on iTunes. And if possible, I prefer to get a set-list order too. That helps me later on while trying to memorize the music. I’ll sync up my iPod (yep, still use one of those) so that I can take this music around with me on car rides, hikes, or plane flights. A freelance musician can sometimes get a call to perform with one artist for eight months straight. Other times, he or she could get called to perform with eight different artists within one week. It helps to have a system of organization to handle this type of workload. Over the years, I have developed my own process that enables me to assimilate tons of songs, and bounce from one job to the next. Here are a few key points to consider. Firstly, the details could always use some clarification. Let’s say a phone call or email comes in asking, “Are you available from February 15th thru 20th?” That does not tell me very much about the job. Therefore, I often begin by digging for more information. What is this mystery gig? Are the proposed dates for rehearsals, a concert, a couple of recording sessions? Will this event take place in Los Angeles, or somewhere out of town? And if the job is out of town, when would I need to leave, and when would I return (keeping in mind the issue of time zones, and the international date line)? For instance, it takes an extra day to fly west over the Pacific Ocean, but on the contrary, you land the same day you take off if flying from Shanghai to Chicago. Who else is on this gig? The “hang” is often as important as the music. What is the pay? Would it be hourly, daily, weekly? What are the travel arrangements? Would we be driving in a van to San Francisco, or flying to Barcelona? Is there some type of cancelation policy between now and then if the entire project falls through, or gets postponed? It’s considerate and professional if they offer somewhere between 50-100% of the income in the case of a cancelation. With all the technology today, having to play along with all of today’s loops and sequenced drums demands a certain level of perfection. However, nowadays there are many software applications that can fix and clean up sloppy performances. I wonder if all this attention to “playing to the grid” or “replacing the programmed drums” takes focus away from developing an original style. I am a fan of all the drummers over the years who had the capability to nail a studio drum take, but also maintained a distinct personal style. Steve Gadd, Jeff Porcaro, Hal Blaine, Al Jackson Jr, Bernard Purdie, and on and on.